Young men around the world continue to think that they can settle their differences via a "fight"; that "male hierarchy" can be determined relatively harmlessly via a "test of physical strength". It's as if young men persist in believing the movie fight myth: that a whole lot of punching will, at worst,cause a bit of bruising and a trickle of blood coming out of one corner of your lips (in a "glamorous" kind of way). This myth is partly perpetuated by the rising popularity of modern MMA. People see professional fighters lasting 3-5 rounds of bruising battle without being killed or seriously injured. If they can do this, how bad can an "amateur punch-up" be? Fights "in the street" involve very different parameters. If nothing else, the surface on which "street" fights take place is far less forgiving. In fact, of all the "one punch deaths" I've seen (dating from my prosecution days) the majority seem to have been caused not by the punch, but by the victim striking his/her head on the ground/kerb. Consider the rather shocking video below: You'll see a man punching two victims and knocking them out. Both fall hard onto the concrete. 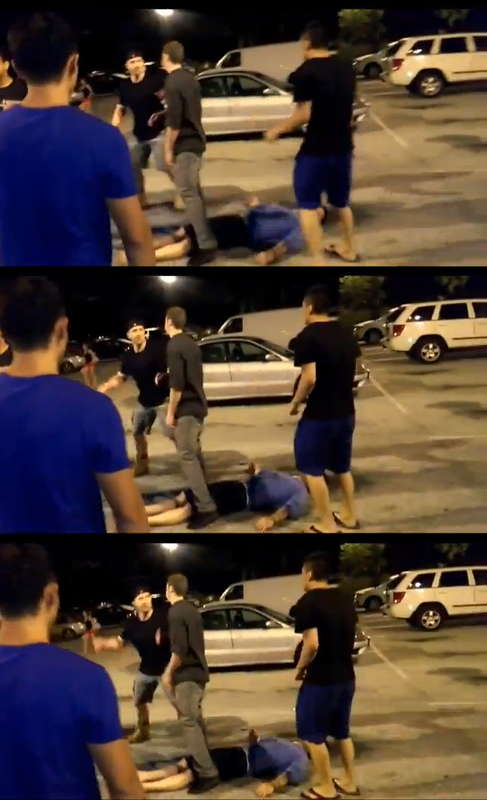 The first falls in such a violent way that his head whiplashes onto the ground taking the full force of the impact. The second doesn't fall quite so badly, but still smacks his head into the ground in a very ugly way (remember, viewer discretion is advised!). I am generally opposed to posting videos of this nature: they horrify me as much as they should horrify most people. And yet, I feel so strongly about the dangers of "one punch" that I felt I simply had to post this as a warning: there is no "safe" way to punch someone in order to "settle a dispute" or "assert dominance". I don't know what happened to the two young men who were punched in this video. I sincerely hope that they are okay. But the truth is that either or both of them could very easily have died - primarily from their heads impacting the ground. Leaving aside the surface on which you fight, what are the other variables that might distinguish this from a "relatively safe" MMA bout? Firstly, it seems that in both cases the young men were knocked out by a "sucker punch". Okay, the second man should have known something was coming - but he clearly didn't. It looked like he'd run up to remonstrate with the puncher - not fight him. I expect that the first man was similarly knocked out after a bit of verbal confrontation - without expecting a sudden punch. In other words, no one said: "Okay boys, I want a good, clean fight: ready... set... go!" Secondly, the young men who were knocked out were probably affected by alcohol. With dulled senses, their defensive capacity was almost certainly compromised. Thirdly, the young men don't appear to have been conditioned for any sort of fighting - never mind taking blows. By contrast, professional fighters develop such conditioning gradually. Moreover they get selected over time by natural pressures: Some people can take a punch much better than others. Those who can't don't "stay in the game" for very long. Consider also that combat sports fighters generally don't go into a match unless they've been through thousands of hours of hard sparring, during which they get conditioned and their coaches get to know whether they're both physically suited to, and prepared for, ring/cage fighting. The victim fails to read the obvious signs of danger (ie. his unconscious companion on the ground, the obvious menacing intent of the perpetrator and the generally highly charged, aggressive and unstable atmosphere). Instead, he runs straight up to the attacker. Not only does he fail to "block" the punch or otherwise evade it: it's as if he has no idea it is coming - even as the arm is chambered to the side. There is virtually no movement on his part: he might as well be frozen stiff. (If you want to see an animated gif of the punch, go here - but again, viewer discretion is advised). Now I know is probably part of the "flight or fight or freeze" response. Regardless, it is an untrained response. It is the response you get when you haven't grooved a suitable situational reflex. Unless and until you have sufficient training that gives you some sort of reasonable reflex for a situation like this, you shouldn't dream of putting yourself into such a dangerous position. In fact, even if you have sufficient training, it is a stupid gamble. If you have little or none, it is positively moronic! I know that young men somehow think that an ability to "fight" should be "natural" and "ingrained": that testing this "ingrained ability" is a kind of "test of their manhood". But when you think of it, skill in fighting is a skill like any other. You have to develop skills. Even if you're lucky, you won't be born with anything other than a natural aptitude. And, like it or not, you might actually have no natural aptitude for "fighting". Take note: if you aren't born a "natural fighter" this is no more a "measure of your manhood" than whether or not you are a natural tennis, golf or snooker player - or, for that matter, surfer, guitar player or artist. Your status as a "man" isn't determined by some sort of "natural aptitude". Nor should your sense of self-worth. Fighting is a skill. If you don't have it, add it to a long list of skills you don't have. Because no matter who you are, there are umpteen things you cannot do, and will probably never be able to do! For example, I can't fly a helicopter, windsurf, abseil, play bridge... the list is endless. Skill in "fighting" (or "defence" - which is subtly, but significantly, different) is just one which we can choose to develop - whether or not we have a natural aptitude for it. In that context, choosing to "test" a skill you've most likely never bothered to develop is, in the case of fighting, not only dangerous, but potentially life-changing - or life-ending. Fighting isn't a game. It isn't a "test" of "manhood". It should only ever be a last resort - a regrettable necessity. Remember: one punch can kill. Don't let bravado make you either the victim - or perpetrator - of tragedy.